If you want to live a life of opulence and extravagance - then book this place, stat. As you roll up to the home away from home. If you want to live a life of opulence and extravagance - then book this place, stat. As you roll up to the home away from home, it will be hard not to gasp and let your jaw drop to the flaw as the regal entrance way, complete with lush greenery, greets you. Wander in the front door, only to be welcomed by a spiral staircase, chandelier and polished marble floors - this really is a stunning place to call home for a few days. Situated on 1.5 acres of landscaped gardens, this villa is set over two sections, the main home and the guest cottage. Of course, both areas offers stunning views over the ocean that are breathtaking. If guests want to relax the Great Room awaits, with books and games aplenty and a room that is air-conditioned so you can luxuriate in comfort. Also on the ground floor of the main home is one of the six bedroom suites, featuring a large four-poster bed and a private terrace. There are another three bedrooms in the main house, each with a private balcony and marble tiled en-suites. Each bedroom also offers a safe, hairdryer, fridge and tea/coffee making facilities - in other words, each room is a tiny slice of paradise set up like a hotel room, with the benefits of having a whole house to enjoy. The Guest Cottage houses two bedrooms, that are also air-conditioned, each with an en-suite. There is a fully-equipped kitchen in the cottage, making it an ideal place for families to escape to so they can keep their routine without interrupting other members of their holiday party. As if this villa was not luxurious enough, there are housekeepers to keep the villa spotless and there are also other staff, such as a chef, a butler and babysitter, available to hire. The pool pavilion is a great place to spend the day, whether you are swimming laps, floating about or simply lying poolside working on your tan. The pavilion also offers a wet bar and a 48"inch gas barbeque, so you can enjoy sundowners in style. Bearded Villa is a truly impressive 6-bedroom holiday home, within the Sugar Hill Resort Community. Guests not only have a private swimming pool & tennis court but the use of the Clubhouse, restaurant, two communal swimming pools and four championship tennis courts. Barbados is a must-visit location, boasting stunning crystal clear beaches that go as far as the eye can see - it's no surprise these beaches are some of the most renowned in the world. If you want to get away to a tropical retreat, Barbados is the ideal location all year round; whenever you want to visit you're likely to be greeted with beautiful warm, sunny days. It's a place where you can enjoy the slower pace of life, appreciating the smaller things - like sunsets, sand between your toes and the sound of waves crashing at night. There are many beautiful beaches to enjoy, of course, from Miami and Rockley Beach to Bottom Bay and Mullins Beach - the latter being one of the lost popular spots in Barbados. Many of the beaches offer sun loungers and have beach bars, so you can spend your days relaxing beachfront. There's plenty to do in Barbados, and not just sunning yourself at the stunning spots. Known for its friendly, welcoming culture you'll want to take in as much of the authentic Barbados experience as you can, from reggae music at sunset to their local delicacy - flying fish. If you fancy a little history you must visit Bridgetown, the biggest town centre that also happens to be a UNESCO site. Wander the streets, take in the sites, and feel the sun on your face. 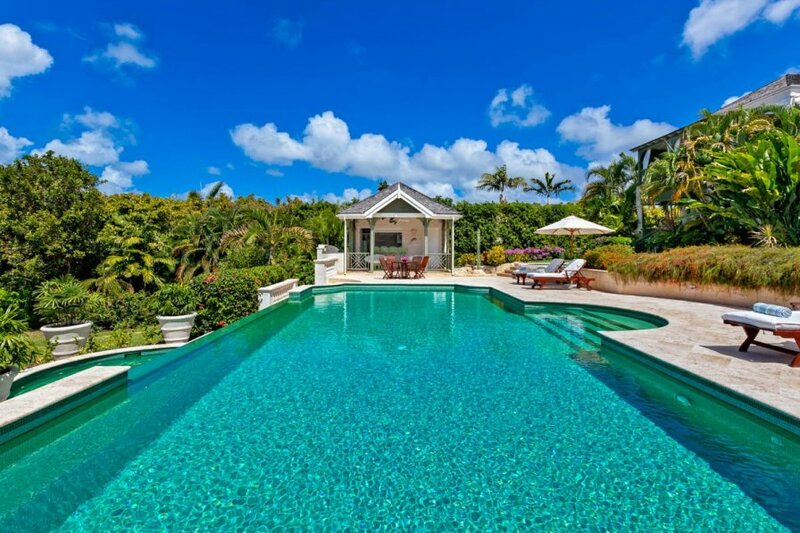 This villa is located in the Sugar Hill Estate, on the West Coast of Barbados. It is near Royal Pavilion Beach Club, Colony Club Beach and Reeds Bay. The villa is situated roughly midway between the two biggest town centres, Speightstown and Bridgetown so whether you are after days by the beach, cocktails at sundown or a little shopping or exploring in the UNESCO historic town, there is plenty to see and do.